CAT Series Air Turnover units are unique floor mounted cooling only units designed to maintain comfortable room temperatures without a duct distribution system. CAT units are available with air delivery from 13,000 to 81,000 CFM. Standard DX cooling coil capacities are from a nominal 27 to 148 tons. Standard chilled-water coil capacities are from a nominal 28 to 140 tons. The CAT utilizes the Air Turnover principle to take advantage of air stratification in buildings with open spaces. It does this by allowing hot air to become trapped at the ceiling. Large volume air movement is provided by energy efficient propeller fans, which turn the room air over 2.5 to 5 times each hour. 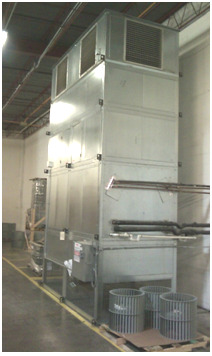 Continuous air circulation then thoroughly mixes the air to maintain uniform room temperature. This uniform room temperature eliminates the possibility of condensation forming on stored materials because of uneven room temperature.